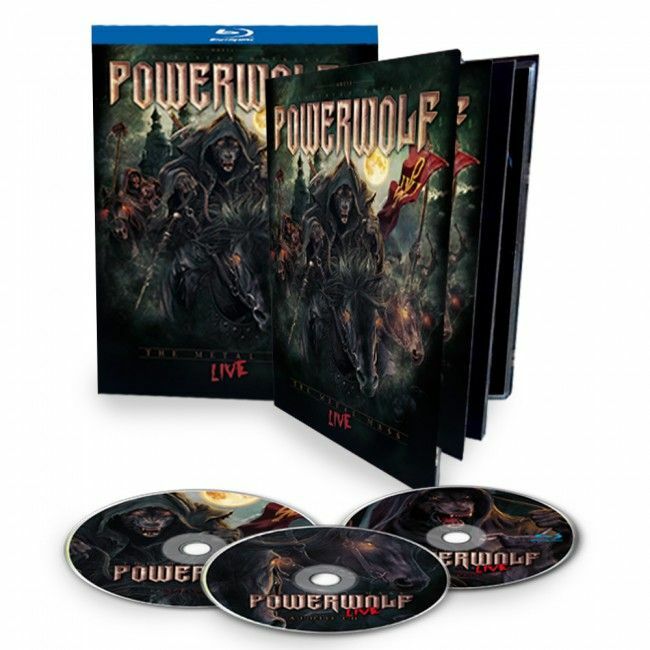 POWERWOLF - THE METAL MASS - LIVE (2BLURAY+CD HIGH-SIZED MEDIABOOK) | Online Shop | Wizard LTD. Album: "THE METAL MASS - LIVE (2BLURAY+CD HIGH-SIZED MEDIABOOK)"
Powerwolf&apos;s history of success truely is a metal fairytale: Thanks to lifeblood, passion and talent the band has gathered an enormous amount of followers with until now six albums and uncountable captivating live gigs. Two albums in the top3 of the German album charts, sold-out headliner shows, frenetically celebrated festival gigs all over Europe – there is just one thing missing… Exactly: a dvd / blu-ray which brings the glorious metal mass on your tv. And of course Powerwolf do it again in style and have assembled a truely opulent package for their loyal fans. “The Metal Mass Live” contains three complete live shows with which you can enjoy the irresistible hooklines and great metal hymns of Powerwolf with live recordings from the Masters Of Rock, the Summer Breeze and the Oberhausen gig from the Wolfsnächte tour. Apart from that all the previous videoclips and two documentaries are included – fans will surely appreciate to witness the hilariously maverick sense of humor of the band members. Of course “The Metal Mass Live” will be presented in a beautiful valuable packaging that will make collectors&apos; hearts beat faster.